Complete quests from now until January 9 to claim winter rewards – win 40 Casual, League, or Duel matches to claim the Arctic Deathstalker, and win 20 rounds in Duel to claim an Arctic Chest! 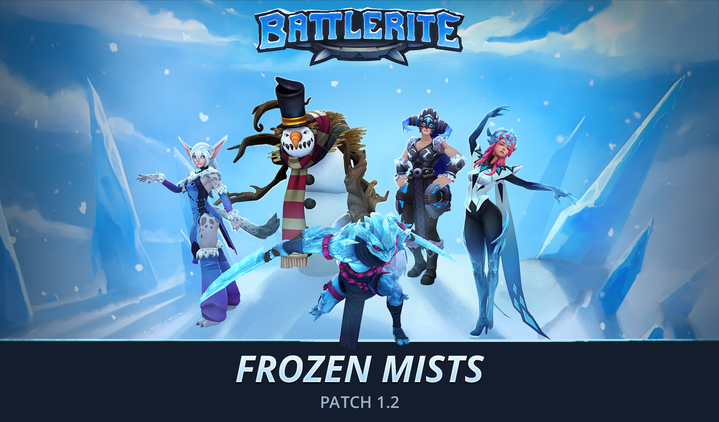 During Frozen Mists you can earn Ice Chests by leveling up your account. These chests can also be purchased directly in the shop with Battle Coins, where they’ve temporarily replaced Silver Chests. These Chests guarantee at least one Rare drop and one random Frozen Item – like a Silver Chest with a frosty touch! If you want a higher change at glittering ice treasures, the Arctic Chest can be purchases for Gems. This frigid chest will guarantee one non-duplicate Epic or Legendary Frozen Item and can be purchased for 250 Gems, or you could purchase 5 at a time for 1250 Gems and receive a bonus Arctic Chest for free! If you’re really, really into Frozen items, you can purchase 20 for 5000 Gems and receive 7 bonus Arctic Chest for free! Like previous events, you can directly purchase Frozen items with tokens at twice the standard cost. You can now change your player name at the cost of 750 Gems. During Early Access it was not made clear whether or not account names would become permanent. There were also fewer characters supported during that time which have since become available. Because of this, all players who own Early Access or Lite accounts have received one free name change. We’ve gathered a lot of data and feedback regarding Battlegrounds during the current Beta state. The team has a good idea of where they want to take Battlegrounds next, as we continue to work on secondary modes we are rotating out Battlegrounds and replacing it with a temporary brawl – The 1v1 Duel Mode. Battlegrounds is still available in Private Match. Challenge your skills and learn new Champions in a 1v1 Duel! Random Champion – Play as a random Champion each round. You will not receive Champion XP and you cannot progress Daily Quests in this mode. Due to current technical limitations, Champions will have default cosmetics equipped. Launch a cold bolt that deals 15 damage. Deals 2 bonus damage and adds Chill duration to enemies affected by Chill. Projectile attack that deals 22 damage and inflicts Chill. Deals 6 bonus damage to enemies already affected by Chill. Soar gracefully to target location. Shield a target ally. Glacial Prism absorbs up to 24 damage for 1.4s. When it breaks, it explodes to inflict Chill on nearby enemies. Call down a frozen star at target location. After a 0.9s delay, it deals 15 damage and inflicts Chill to enemies in the area. Inflicts Freeze to enemies already affected by Chill. Launch a fragile sculpture that knocks enemies back and blocks enemy attacks for 1.5s. When it breaks, it launches a cone of icicles that deals 20 damage and inflicts Chill. Mark a path of frost in front of you. After a 0.9s delay, the patch deals 35 damage and inflicts Freeze to enemies hit, turning them into beautiful statues. Freeze target ally for 3.5s, making them immune to disables and blocking up to 40 damage. Ally cannot move or use abilities while frozen and heal for 30. Knocks back enemies and inflicts Chill when it expires. Channel a cone of snow that deals 24 damage and inflicts Chill over 0.9s. Inflicts Freeze when you hit a Chilled target. Target moves up to 20% slower, scaling up with remaining duration. Max duration of 4s. Target gains a shield that absorbs up to 20 damage. Target is immune to Chill and is unable to move or use abilities for 3s. This effect breaks when the shield breaks. Alysia can be purchased in game for 900 Gems/5800 Battle Coins. Ownership of Alysia is required to purchase this chest. Contains 3 random drops. Guarantees at least one non-duplicate Rare, Epic, or Legendary Alysia item and one Rare normal item. Ashka’s Molten Fist now works like most defensive abilities and can be used to interrupt your own cast times or immediately after using another ability. Some of the power in his rites are being moved around to encourage players to explore different options. Fixed a bug where a target would still count as “controlled” for the full duration of the Shield Dash after it ending due to hitting a wall. Croak’s Severe Toxin hampers enemy movement while giving incredible sustain. We’ve split the power over his two Toxin empowering rites, leaving Mending Toxin with only the increased health restoration. Lethal Toxins loses its direct damage component, but now snares enemies to give greater followups. Destiny’s Charged Bolt had a bug with its silence duration after interrupting an enemy’s ability with spellblock. The duration has now been changed to 0.7s, and can be increased to 1.4s with the System Shock battlerite. Her Power Attachment battlerite offers a bit too much firepower on the top end, so it has been scaled down. Freya has many shields and dodges in her kit, making it feel hopeless to land real damage on her. Thunderclap’s cooldown has been slightly increased to decrease the frequency of her airtime while also scaling down the power of her Thunderclap battlerites. Hammer Time cooldown reduction for Thunderclap has been increased substantially for players that still want to have plenty of defense.